President Buhari earlier today, presented the 2017 budget proposal before a joint session of the National Assembly. 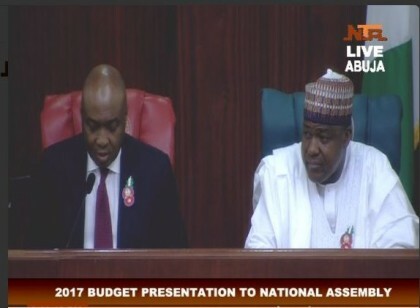 In his welcome speech, the senate president, who is the Chairman of the National Assembly assured president Buhari that the National Assembly will not waste time in the consideration of the budget proposal. “It is my pleasure on behalf of my Distinguished and Honourable colleagues to warmly welcome you Mr. President and your entourage to this joint session of the National Assembly. “Mr. President, while we may have struggled with key aspects of our budget process in the past, I am happy to note that we have made some important progress. “To start with, we are seeing the budget presentation coming slightly earlier this year. Though, we hope tosee an even greater improvement on this in the coming year. But more importantly however, is that so far this year’s budget process has benefitted from greater cooperation and consultations between the National Assembly and the Executive. “Mr. President, I wish to note that the National Assembly recognizes however that the problem with our budget and budgeting process goes far deeperthan the relative progress we have made. This is why in August this year, I inaugurated a joint Executive/Legislative committee and a technical committee to review our budget systems and identify ways we can make them more transparent, more participatory, more result oriented and therefore more effective. “The committee has since submitted its report and the National Assembly is already started the process of implementing the recommendations. “Our hope is that the remainder of the recommendations of this report will be implemented within the 2017 budget year with the passage of the Organic Budget Law. “The Organic Budget Law will provide the legal framework for regulating the procedures that budget preparation, approval, implementation and even accounting must follow. It will bring the budget and national planning regime within a clearly defined framework, thereby ensuring greater predictability, transparency and efficiency. “When the current National Assembly introduced the Civil Society Public Hearing on the Budget initiative, the idea was to open up the budgeting space by incorporating the Civil Society into the budget process, thereby ensuring greater transparency and accountability. We are proud to say that this engagement has come to stay as a crucial part of our budget approval process. “Mr. President, distinguished colleagues, honourablemembers, you would recall when the National Bureau of Statistics NBS came out with the numbers to confirm that the Nigerian economy has slumped into recession, the National Assembly rose with one voice. Through a joint resolution, we recommended that you make a “state of the nation” address on the plan of government to get us out of recession and have 20 important Executive actions that in our view needed to be taken to get the economy back on track. The National Assembly on its part listed and prioritized 11 economic reform bills for passage. We intend to get these bills ready alongside the 2017 Appropriation bill. We believe that the core elementsof these bills will aid the Executive in mobilizing the required private capital into the general economy, but especially the infrastructure market. “In the thinking of the 8th National Assembly, our country can no longer rely on the public sector alone to spend us out of recession. It is therefore critical that we mainstream private sector business and investment in the economy. To achieve this, we must make it much easier and efficient for people to invest and do business in our country. “Further to this, we are also aware that if we must attract private investments to play a central role in our economic recovery efforts, must make deliberate efforts to market Nigeria as an attractive brand through a very robust and highly coordinated process of engagements. This effort must necessarily start with injecting confidence in the market through clarity and consistency of policies. We must speak the right language and show that we are open to and ready for legitimate business. “I wish to reassure Mr. President that the National Assembly would continue to seek opportunities to deepen this relationship because we are convinced it is the only by working closely together that our country can make the progress that we all desire. “The overarching purpose of a budget is essentially to ease the economic pressure on our people in general and the poor most especially. The 2017 budget assumes even a greater significance, particularly in this time of recession. Mr. President, the feedback we get from visits to our various constituencies is that there is hardship in the land. We can see it and we can feel it. This situation therefore commands all of us as government to a greater sense of urgency. We cannot work magic, but we must continue to work the clock. “Our people must see that the singular pre-occupation of government is the search for solution to the current economic hardship; and the commitment to ease their burden. They don’t want to know what political parties we belong, what language we speak or how we worship God. They have trusted their fates into our hands, and they need us now more than ever, to justify the trust that they have reposed on us. The people of Nigeria will pardon us if we do some things wrong. But they will not forgive us if we do nothing. And that is why, Mr. President the two chambers have taken a position whatever may be our differences, or opinions on issues of the economy we will all work with one common purpose for this reason. “It is in times like this, when we are challenged from all sides that we need to develop new relationships and cultivate more friends. No one can clap with one hand and expect to be heard. This is the time when compromise, engagement is the tool necessary for successful collaboration and cooperation. “This is why I encouraged the Executive to continue with its engagement plans across all sections and stakeholders in the country particularly with our brothers in the Niger Delta and all parts of the country where instability is impacting on our collective economic and security aspirations. “Mr. President, you will recall in 2015, , I made a clarion call while receiving Your Excellency’s budget presentation for that year that the 2016 budget needed to be bold and pragmatic to drive local production and promote made-in Nigeria goods. “Today, permit me Your Excellency to reiterate this call. The only way we can cut down on our foreign exchange needs, create jobs and stimulate entrepreneurship in the country is to promote local manufacturing and investments. “This is why the National Assembly injected the made-in-Nigeria amendment into the Public Procurement Act. We are expectant that with your leadership, Mr. President, we will achieve even much more in this area. It is the hope of the National Assembly that the 2017 budget will continue to proactively pursue this policy objective. “Mr. President, though we are confident that we are receiving from you a very well-articulated budget proposal, it is worthy to point out that the best produced budget from the executive at all times still remains a proposal according to our constitution which the National Assembly will work assiduously on. “On behalf of the National Assembly, we commit to work on the 2017 budget, conscious of the responsibility that the current economic situation imposes on us and driven by the urgency to alleviate the suffering of our people and also bearing in mind your aspiration and vision for our people. We assure you Mr. President and all Nigerians that not even a single minute would be wasted on our side in the course of getting this budget approved. “With these few words, I hereby invite Your Excellency to deliver your speech and lay the 2016 budget proposals for the consideration of the National Assembly in accordance with Section 81 of the 1999 Constitution of the Federal Republic of Nigeria as amended.